1. Preheat the oven to 180°C/R4. 2. Lightly spray a rectangular ovenproof dish with low calorie cooking spray. 3. Spray a large non-stick frying pan with low calorie cooking spray and place over a medium heat. Add the onion and mushrooms and stir-fry for 10 minutes. Stir in the garlic and spinach and cook for 6-8 minutes or until the spinach has wilted. 4. Meanwhile, put the cottage cheese and nutmeg in a mixing bowl. Add the eggs, season to taste and beat until fairly smooth using an electric hand whisk. 5. Spread half of the passata over the base of the prepared dish and top with four lasagne sheets. 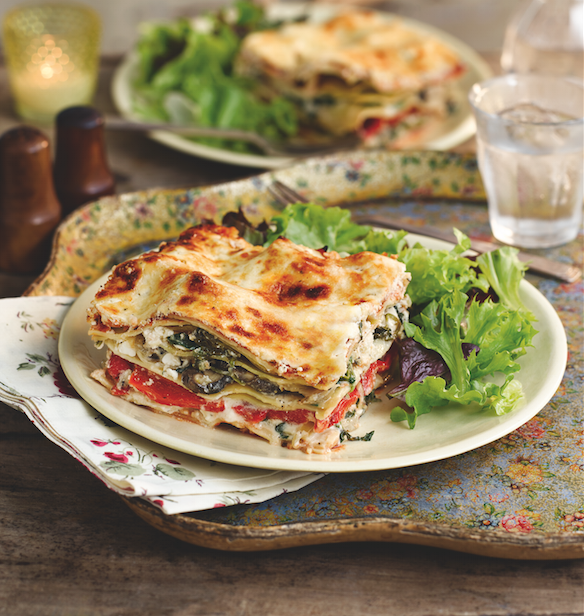 Spread one-third of the cottage cheese mixture over the lasagne sheets and top with half of the mushroom mixture. Sprinkle over half of the Parmesan-style cheese. 6. Arrange the pepper pieces over the cheese in an even layer and top with four more lasagne sheets. Spread over the rest of the mushroom mixture and half of the remaining cottage cheese mixture. 7.Top with the last four lasagne sheets, the remaining passata and the rest of the cottage cheese mixture. Sprinkle over the last of the Parmesan-style cheese, cover with foil and bake for 30 minutes. Remove the foil and cook for 15-20 minutes or until the top is lightly browned and the pasta is tender. 8. Cover with foil and leave to stand for 25-30 minutes. Serve with a crisp salad.